High school senior George Marvin has attracted national attention to tiny Oakwoods with his award winning science project. George’s sudden notoriety, along with the construction of a housing development and resort, has the fading mountain town standing on the verge of being reborn. Will a dark discovery derail this new found hope? Oakwoods is a story about accomplishments beyond our wildest dreams and the unexpected places they can lead us. 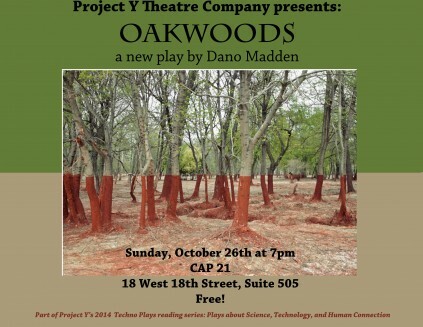 DANO MADDEN is a playwright and director. His plays have been produced and/or received development by Actors Theatre of Louisville, The Source Festival, The Artful Conspirators, World At Large Theatre, Mile Square Theatre, Burnt Studio Productions, Northwest Playwrights Alliance, Idaho Theatre for Youth, Kitchen Theatre Company, Rutgers University, The University of Tulsa, Bloomsburg University, Boise State University, McGill University, Seattle Repertory Theatre, Lark Play Development Center, Seven Devils Playwrights Conference, Fresh Ground Pepper and Boston Theatre Works, among others. He was the winner of the Kennedy Center’s 2007 National Student Playwriting Award and was a finalist of the National New Play Network’s 2010 Smith Prize. Published works include: In the Sawtooths and Drop (Samuel French, Inc.), Ella (Best American Short Plays 2009-2010), Beautiful American Soldier (Part 1, Best American Short Plays 2005-2006), The Save (Playscripts, Inc.), The Soft Sand (Northwest Playwrights Alliance), Survival (Northwest Playwrights Alliance) and monologues in The Best Men’s Stage Monologues and Scenes 2010 (Smith & Kraus) and Exceptional Monologues 2 For Men and Women (Samuel French, Inc.). Dano received his BA from Boise State University and his MFA from Rutgers University. He is an adjunct professor of playwriting at NYU. He lives in Hoboken, NJ with his wife Lauren and their cat Beth. MELISSA FIRLIT is a freelance director and teaching artist in the New York City area. Recent credits: Misterman (Thingamajig), BUBBA (FringeNYC, Planet Connections, Mile Square, UnitedSolo Festival, Theatre Tuscaloosa, Rutgers), Bunting or Flags (New Light Theater Project), Red (Pagosa Springs Center for the Arts). Annabel Lee (Apothecary Theater Company), Murder Mystery Macbeth (Co-Lab Arts), Someone to Buy It(EST’s Youngblood), C- (Orlando Fringe Festival), A Nasty Tempered Man (Theatre for the New City). She has worked with idtheater’s NYC sit in series. She teaches for the McCarter Theatre Company’s education program and is currently directing STOP KISS at Wagner College. Training: MFA: Rutgers University, University of Hartford and The National Theater Institute. Check out her website www.melissafirlit.com.